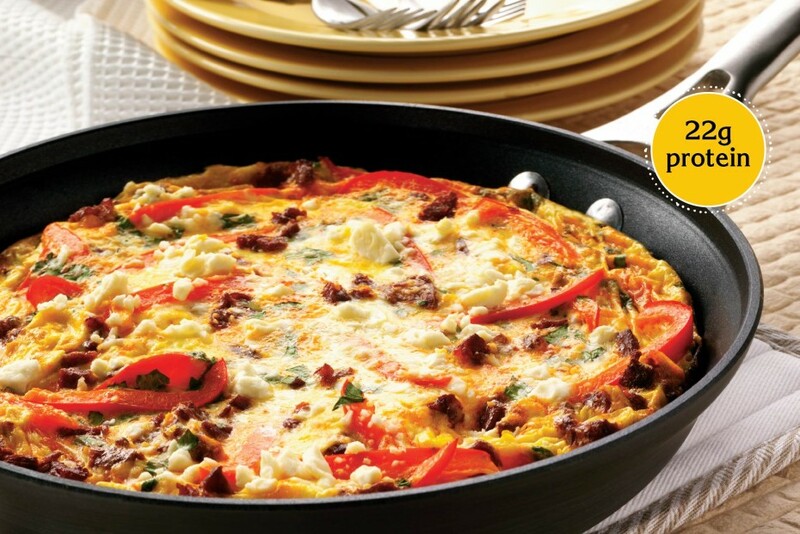 Add spice to your breakfast or dinner with a yummy frittata loaded with chorizo sausage, eggs, cilantro and cheese. COAT large nonstick skillet with ovenproof handle with cooking spray. COOK chorizo over medium heat, breaking into crumbles, until browned and cooked through, about 5 minutes. POUR OFF drippings. ADD bell pepper to skillet; sauté until softened, 3 to 4 minutes. 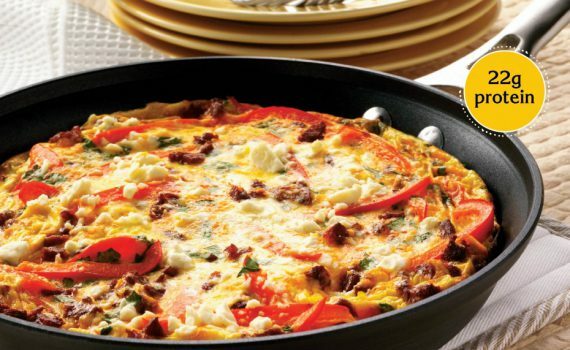 POUR IN eggs; mix lightly and sprinkle with cilantro. Gently SCRAMBLE eggs over medium heat 1 minute. Reduce heat to medium-low. COVER and cook until eggs are almost set, 6 to 8 minutes. UNCOVER skillet; sprinkle with cheese. BROIL 6 inches from heat until eggs are completely set in center, 2 to 3 minutes. CUT into wedges. To make handle ovenproof, wrap it completely in aluminum foil. 3 oz. cured chorizo sausage link, finely chopped can be substituted for fresh chorizo. Sauté just until heated through, about 1 minute. Queso fresco is a fresh crumbly Mexican cheese. A fresh goat cheese or a mild feta can be substituted.